Although we've had no nice weather for growing plants outdoors lately, some of the farmers who sell at Argus Farm Stop not far from our house have been growing nice green leaves in their hoop houses or otherwise under glass. Shopping there today I found some sorrel -- a delicious, sour leafy green that's common in parts of Europe but quite hard to find here. 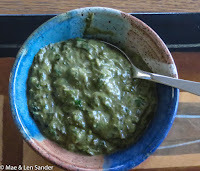 I made it into a puree with some parsley, olive oil, and a bit of garlic. All were briefly cooked so that the leafy parts were just wilted, and then pureed with the immersion blender. Traditionally, sorrel is the main ingredient in the Eastern European soup called Schav, or Green Borscht. I don't recall ever tasting it in my childhood, probably because no sorrel was available: we just had spinach or beet borscht. Sorrel (oseille in French) is also an ingredient in the very famous dish "Saumon à l'oseille façon Troisgros" -- that is, salmon with sorrel puree in the style of the Troisgros brothers, who owned a famous restaurant in Roanne, France, and were pioneers of the Nouvelle Cuisine in the mid-twentieth century. 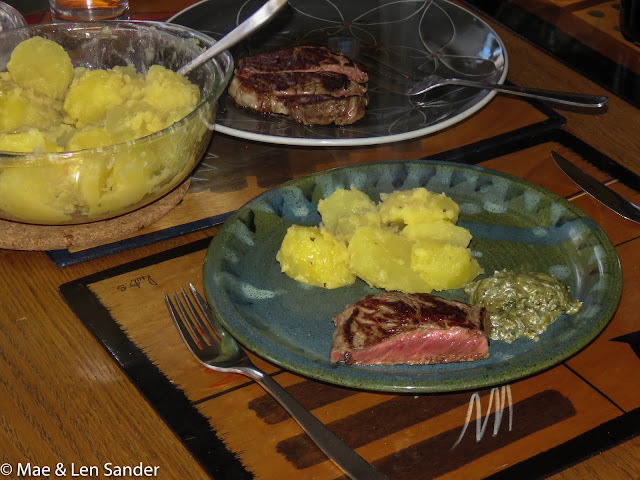 Our dinner tonight: pan-broiled steak, potatoes in olive oil dressing, and sorrel puree. Sorrel is mentioned by a variety of French and Russian/Jewish authors -- and one Canadian -- that I've read, including Zola, who considered it a food for poor people. You can see all the times I've read about it or used it (including this one) by clicking here: sorrel. I don’t think I have ever seen sorrel, around here but there is always something I miss at the local markets. I tend to browse the same produce sections. Looks like a good meal. 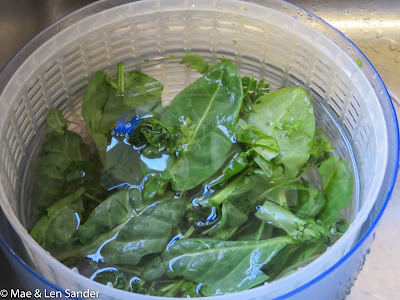 Sorrel is one of my favorite greens! I love the tangy lemony flavor. My CSA grows sorrel all summer and we get to pick some each week. Since very few people even know what it is, they often will say, Oh just take my share ( and I do) . My Bubby used to make schav- i didn't like it as a kid, but I love it now. 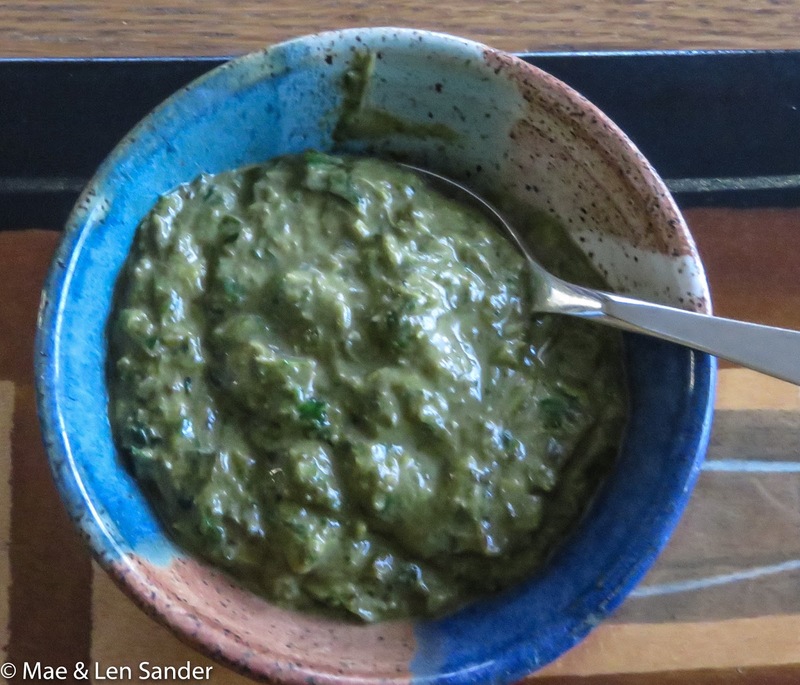 If you do a search on my blog for schav or sorrel , you will see my bubby's recipe. I’ve never grown sorrel, nor have I ever tasted it. It looks lucious! I used to grow sorrel .. I like it's tangy flavor. I have never had green borscht. The only time I ever liked any borscht was when I traveled to Russia and had it there. But I don't drink either red OR green here! Actually, I'm not a soup person. But it sure LOOKS interesting! I do not believe I have ever had sorrel and if I did I didi not know what it was called. Is this a play on words-you are bringing out your SORRELL'S in April for the graupel?